points on why S. zena would travel such a distance. The main reason, food supply, was and still is bountiful in Long Pine Key in Everglades National Park (Manfredi). The type of food S. zena eats is fruit from fruit-bearing bushes (Manfredi). It also eats the tips of the leaves and has been observed also eating snails (Handbook of the Birds of the World). The ability of S. zena to fly from Cuba to Florida makes it easy to suspect and corroborate a claim that it can get to any island of the Caribbean. Each of the major islands of the Caribbean (like Haiti or Puerto Rico) have their own sub-species of Spindles zena. I will talk more about this later. It has been suggested that since each sub-species is so similar and that individuals are able to fly from island to island, these sub-species of S. zena may in fact be an interbreeding group. Spindalis zena’s name has a long history. At the surface it is very confusing but a fellow birder puts all of the name changes in perspective. Many different names are used to describe this one bird. Some call it the Stripe-Headed Tanager and others the Western Spindalis. 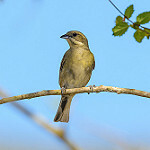 When this species was first discovered by Lineaus he named it The Bahama Finch (Gooch). Spindalis zena may be a polytypic species (Garrido). Subspecies of that species fall under this species heading total eight and are as follows; S. z. townsendi, S. z. zena, S. z. pretrei, S. z. salvini, S. z. dominicensis, S. z. portoricensis, S. z. nigricephala, and S. z. benedicti (Garrido). All of these birds are found on different islands in the Caribbean. The potential polytypic S. zena has all of these subspecies primarily because of different island locations and slight variations of color in the females (Mike)(Bond). If sub-species designations were only based on female colorations, however, then there would only be three subspecies S. z. dominicensis, S.z. zena and S. z. nicricephala (Bond)(Garrido). As of now only four subspecies are recognized by (Carla C.) and others in the Forty-Second Supplement to the American Ornithologists’ Union Check-List of North American Birds. (Mike) and (Carla C.) agree in saying that the old name Stripe-Headed Tanager is to be split up into four sub-species (S.z. dominicensis, S.z. zena, S.z. nicricephala, and, S.z. portoricensis. This four sub-species split is supported because the tanagers of the mainland are considerably different (Mike). Although S. zena is still a tanager it’s future in that family is uncertain because of the ongoing reclassification of the tanager group and its proposed merging with Cardinalae. S. zena is one of the last, if not the last true tanager you can witness in the United States (John Shwarz). This bird is breathtakingly beautiful. The males have more dramatic plumage than the females with a burnt yellow plumage color that fades to dark orange(Neotropical Birds). The yellow stops right before the head which is in turn mostly black with white stripes coming up from the back under the chin and over top of the eyes(Neotropical Birds). The females have an even olive color on the chest and head with brownish olive wings marked with lighter streaks throughout (Allan Hopkins). Both males and females have short, thick bills (Bond, Kevin). S. zena primarily eats the berries of the fruit bearing shrub Dunalia arborescens (Cruz Bird). As mentioned previously, it also eats leaf tips and on ocassion snails. Seeds of the D. arborescens are widely distributed in the feces of S. zena and the widespread distribution of this shrub may be largely due to this dispersal mechanism (Cruz Feeding). During mating males exhibit elaborate courting displays that include long slow ascents in flight and big circular paths flown above the trees followed by shard dives back toward the ground. These dives are possibly signs of the health of the male bird. This mating display can be seen throughout the Caribbean from April to August. (Handbook). The Western Spindalis perches high in the canopies of trees possibly in order to to project their high pitched songs over as great a distance as possible (Leck). Their song is almost too high to hear but makes a see-tee type of sound (Handbook). In a study done by (Waide) said that they found no S. zena on the forest floor or even in the mid-canopy level. All of the indivduals were observed in the very tops of the tree canopies. These high canopy locations may also be a mechanism by which the birds avoid predators when engaged in attention gathering song (Waide). Buden, Donald W. “Prey Remains of Barn Owls in the Southern Bahama Islands.” The Wilson Bulletin 86.4 (1974): 336-43. JSTOR. Web. 30 Sept. 2015. Chapman, Frank M. “The Origin of the Avifauna of the Bahamas.” The American Naturalist American Naturalist, The 25.294 (1891): 528-39. JSTOR. Web. 28 Sept. 2015. Cruz, Alexander. “Feeding Assemblages of Jamaican Birds.” The Condor 76.1 (1974): 103-07. JSTOR. Web. 28 Sept. 2015. Garrido, O.H, et al. “Taxonomy Of The Stripe-Headed Tanager, Genus Spindalis (Aves: Thraupidae) Of The West Indies.” Wilson Bulletin 109.4 (1997): 561-594. Wildlife & Ecology Studies Worldwide. Web. 28 Sept. 2015. Leck, Charles F. “Observations of Birds at Cecropia Trees in Puerto Rico.” Wilson Ornithological v2Society, 4th ed. Vol. 84. (Dec. 1972): 498-500. JSTOR. Web. 28 Sept 2015. Pardieck, Keith. “Mesh Size as a Factor in Avian Community Studies Using Mist Nets (Orificios De Tamaño Diferente, Como Factor En Estudios De Comunidades De Aves En Donde Se Utilizan Redes).” Journal of Field Ornithology 63.3 (1992): 250-55. JSTOR. Web. 28 Sept. 2015. Pranty, Bill, and William P. Smith. “Status, Distribution, and Taxonomy of the Spindalis Complex (“Stripe Headed Tanger”)” Florida Field Naturalist (2001): 13-25. Google Scholar Web. 27 Sept. 2015. Waide, R. B., and P. M. Narins. “Tropical Forest Bird Counts and the Effect of Sound Attenuation.” Auk 105.2 (1988): 296-302. ProQuest. Web. 29 Sept. 2015. Abbott, Pegg, and Wayne Peterson. Cuba’s Endemic Birds. 2015 International Expeditions, 28 Mar. 2013. Web. 29 Sept. 2015. Bond, Kevin. Stripe-headed Tanager. EBirdr. Larry Bond. Web. 4 Dec. 2015. Cunningham, Vale. “Birder Gets a Rare Glimpse at the Birds of Cuba.” Star Tribune. Star Tribune, 24 June 2014. Web. 29 Sept. 2015. Gooch, Laura. Stripe-headed Tanager. The Website of Everything, 2010. Web. 29 Sept. 2015. Larry Manfredi. South Florida Birding, n.d. Web. 28 Sept. 2015. Mike. “When Is A Tanager A Spindalis?” 10,000 Birds. 10,000 Birds, n.d. Web. 29 Sept. 2015. Shwarz, John. Western Spindalis. Birdspix. Earthbound. Web. 4 Dec. 2015. 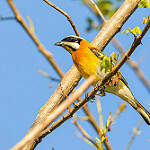 Western Spindalis (Spindalis Zena). Handbook of the Birds of the World, n.d. Web. 29 Sept. 2015. Western Spindalis. Field Guide to Birds of North America. Mitch Waite Group, 2002. Web. 29 Sept. 2015. 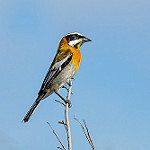 Western Spindalis (Spindalis zena). Species. N.p., n.d. Web. 29 Sept. 2015. Flickr. Yahoo!, n.d. Web. 30 Sept. 2015. <https://www.flickr.com/>.